What Is A True Country Ham? Only the South Knows for Sure! 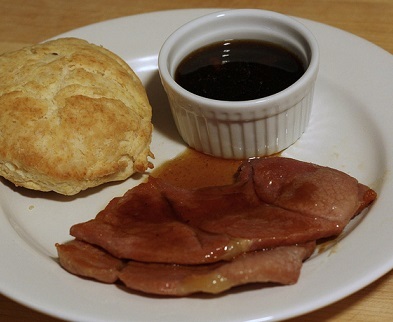 What Is Country Ham And Red Eye Gravy ? So-called country hams are special hams. Most hams purchased today cannot really be called "country hams." Red Eye Gravy can be made with water or strong coffee. Which is best is highly debated to this day, even though the recipe probably originated during the war of 1812. More about that later. First, let's "talk" about ham. When I lived in the South (USA) for a brief period of time, I learned quickly that not all hams are created equal. A real Country ham is soaked in a salt water brine or salt mixture for several days and then rinsed off and slowly smoked. It is then hung to dry cure for 6 to 12 months or longer. This method of preserving ham was developed during America's pioneer days, long before refrigeration, and was refined (perfected?) since then. In the South you cannot call just any ham a "country ham." A true Country ham often comes in a cloth bag (now specially sealed plastic) and is salty and dry and can be covered with mold. Is this bad? No, not if you know how to prepare the ham. Don't worry about the mold. As long as the mold is only on the outside, the ham is fine. Just scrap it off and wash it off. The real concern should be to get the salt out of the ham. To do this you need to soak the ham in water to draw the salt from the meat and to add back moisture. If you have a really small ham (6-10 pounds) soaking it for about 12-16 hours should get most of the salt out. Most experienced people tell me it is better to soak the ham for at least 2 days. If it is a large ham, 3 days. Make sure the Country ham stays cold while you are soaking it (about 40 degrees F). This helps assure that bacteria will not grow. Change the water every 6-8 hours and as you do so, rinse the ham itself. Cook your ham at a low temperature but make certain to get the internal temperature up to 160 degrees F. You can cook the ham on a grill or in a smoker or your oven. At a low grilling or cooking temperature of about 300 degrees F. your ham should be done in about 3 to 4 hours, depending on size. Use your meat thermometer. 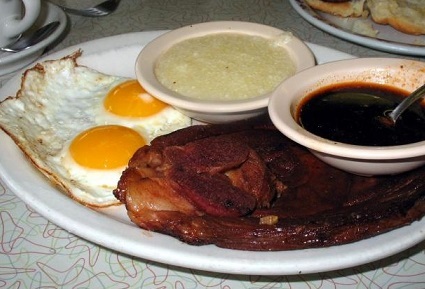 Red eye gravy is well known in the South, but many people in the rest of the United States have never heard of it. 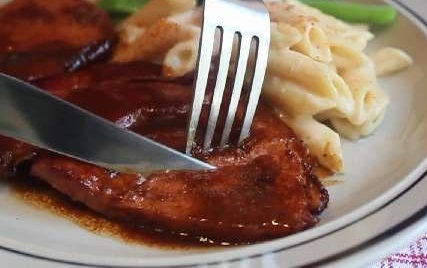 The gravy is made from the ham drippings and strong black coffee. Some people use water and that's what the so-called controversy is about. Which way tastes better? You decide for yourself but I use coffee (and then add a little water if the gravy is too salty or too strong). Legend has it that during the War of 1812, General Andrew Jackson (later to become the 7th President of the U.S.) ordered his cook to prepare him a ham dinner. The cook had apparently found enough liquor to drink himself to sleep several hours prior to being told to perform his duties and his eyes were very red. Jackson looked at him and told him to also make a gravy that was as red as his eyes. Country Ham Red Eye Gravy was the result. 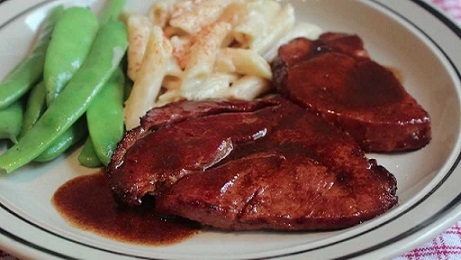 Enjoy cooking a ham with red eye gravy and the company of those you share it with! Did you know? 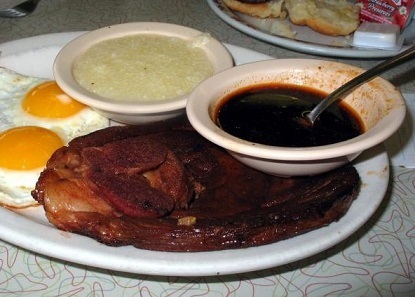 Red eye gravy is also known as red ham gravy, bird-eye gravy, muddy gravy, muddy sauce, and poor man's gravy.